What happens when you combine the wonderful contours of a spa with the enjoyable compact nature of an endless pool? You have the Endless Pool Swim Spa, which is the perfect solution to the stresses of modern day life. So whether you choose to sit back and relax in the spa seat or have a cleansing swim for everyday fitness, the Endless Pool Swim Spa is the perfect place to unwind. 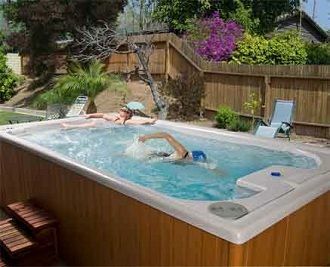 The Endless Pool Swim Spa has a wide range of features that make it a welcome addition to any home. Underwater lighting and jets within the spa can be controlled within easy reach from the spa seats and there is a remote control function that will enable you to turn the swim current on or off and the speed can be adjusted from a simple breast stroke to a challenging hundred yard swim. The spa seats have been specifically designed to aid access in and out of the spa, and it will allow you to build a deck of stairs if you wish.